Camp Frack was a huge success! It attracted activists from all around the country as well as local residents who were a big part of the camp's success. There was lots of media coverage. Have a look at the video reports below on Camp Frack, as well as footage from the demo. Involved in the camp, as well as the Campaign against Climate Change was local group 'Ribble Estuary against Fracking' (REAF) , national anti-fracking group 'Frack Off', various Climate Camp groups (eg Liverpool and Yorkshire) as well as members from Friends of the Earth groups and the Cooperative Society - as well as individuals from all over! LATEST NEWS: CAMP FRACK FOLLOW UP ! Following Camp Frack, on Wednesday 21st September, Cuadrilla Resources held a Press Conference at the Imperial hotel, Blackpool, announcing it had discovered huge amounts of gas (200 trillion cubic feet), was planning to drill at least 400 wells in Lancashire to extract it, and promising thousands of jobs would be created as a result (there may have been strong financial reasons why Cuadrilla needed to publish good results now: see here and doubts have now been cast on their claims - see here) . 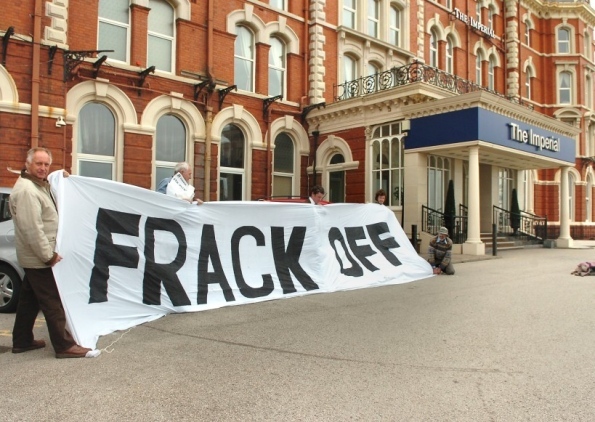 This was a major media offensive from Cuadrilla but having heard the news we srambled to get there and were able to organise a small but noisy protest outside the meeting (see posed photo at start of demo below). We were able to give the other side of the argument highlighting not only the destructive environmental impacts of fracking but also the need for investment in the renewable energy industry, creating jobs in that sector rather than in another fossil fuel - which will increase the levels of carbon dioxide emissions and lead us further down the path to climate catastrophe. 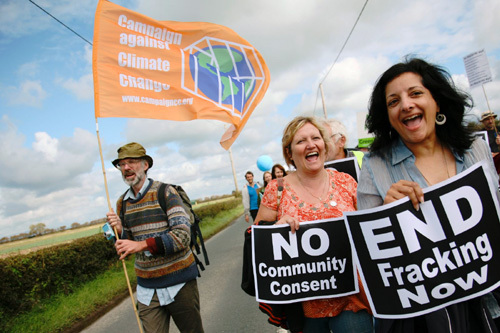 Beforehand, Camp Frack had amassed interest from the media, including The Guardian and the Blackpool Gazette. George Monbiot also wrote an editorial on fracking mentioning the camp. Caroline Lucas and Michael Meacher have submitted an EDM calling for a moratorium on coal bed methane, shale oil and shale gas. Read it here and get your MP to sign it. Download a template letter to send to your MP here. See about the anti-fracking banner placed 500 feet up Blackwall Tower here. See our shale gas page here. To download a flier about fracking (you could improve it or make your own!) click here. You can also download a Word version for editing here. Finally for an irreverent light-hearted view of the Blackpool gas "bonanza" see here.